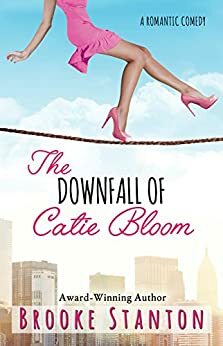 A fun easy read about someone who has gotten herself in over her head with twisting the truth, and has to see if she can get herself back out of the mess unscathed. The book is funny enough, but it is overdone. I like watching characters’ lives implode around them, but how can one lady have so much go wrong in her life so quickly; as well as have everyone important to her turn against her, even her sister. Catie doesn't think it is all her fault and I agree. One notable example is like how her sister got money, got her recipes out there, and didn't even have to go in front of the cameras and then Catie is outed as a fraud and because it effects her sister the sister turns icy. It just makes Catie not trust anyone and makes her want to hide from all the reporters. She's also paranoid from the same and from her boyfriend. The characters were against Catie the whole time. They were the ones insistent in keeping their house of cards together, but then the second something happens, they all turn on Catie. Just, ugh, those people who loved her persona and those in her personal life are just unbelievable in their about-faces. If you love a recipe a TV chef shared with you does it really matter to you if the person on TV came up with it or a person off-screen did? Maybe I’m one of the few, but if I like a recipe I like the recipe; if I found out the chef’s sister provided it to her I wouldn’t care, let alone send death threats to the chef. Compared to the last book I read in this series (book one), where they had pushed Catie to keep it a secret. She had been willing to confess it all in book one, but they told her not to, and then when the truth, inevitably, comes out they get mad. The part that really gets my goat is that the people in her personal life, who insisted she stay quiet to start with, know that Catie is a good person who does charity work and shares her wealth inexplicably hate her when she’s outed. Wow I love each of the three books in this series about the Bloom sisters . The last book has Catie losing just about everything because of the choices she had made and not realizing the people she hurt along the way, including herself . I highly recommend this great series . 5.0 out of 5 starsBloom..ing Amazing! Just finished the last of the Bloom sisters trilogy. Absolutely wonderful! I felt like I was right there with Catie and Natalie every step and misstep along the way. I laughed. I cried. I gasped. And I breathed sighs of relief. I hope that you keep writing more stories. I will be a waiting fan! Thank you. I love reading books by Brooke Stanton. They are funny but yet down to earth. They help us know that women are awesome with all of our faults and strength. Every time I read one of her books I hate to put it down. Funny, well written. Catie's life is imploding. This story is about a messy, imperfect life. Brooke Stanton does an amazing job with what could be a tragedy. We are along for Catie's efforts to rebuild her life. There is pathos, humor and romance. Very enjnoyable.